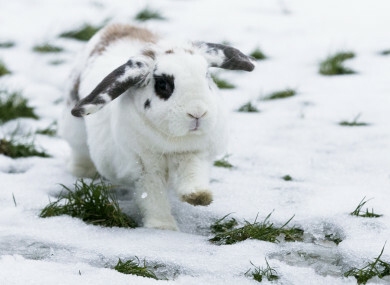 A rabbit pictured in snow in Dublin in March 2018. A NATIONAL STATUS Yellow snow-ice warning kicked in at 6am today and will remain in place until 6pm on Saturday. This week will be very cold with scattered wintry showers, frequent across the southwest, west and north. Met Éireann has said some accumulations of snow are expected. There will be widespread frost at night with icy stretches on untreated surfaces. There is the possibility of a more significant spell of sleet or snow on Thursday. Today, rain and sleet will clear eastwards leading to a cold day with a mix of sunny spells and scattered wintry showers. The showers are expected to be frequent over the western half of the country with falls of snow expected. Some of the showers will be heavy with the risk of hail and thunder in Atlantic coastal areas. Maximum temperatures will range from just two to five degrees in fresh and gusty westerly winds. It will be cold and frosty tonight with clear spells and wintry showers giving further falls of snow in parts. Lowest temperatures will range from zero to minus three degrees. Tomorrow will be cold and frosty with snow lying in some areas. It will be a bright day with sunny spells and a few wintry showers. The showers will tend to become isolated later in the day. Highest temperatures will range from two to five degrees. Tomorrow night will be dry, cold and frosty initially but sleet and snow will affect much of the southern half of the country later in the night. The rain, sleet and snow will continue across the south during Thursday but the northern half of the country will remain largely dry. It’s expected to be very cold with high temperatures of just one to four degrees. There will be severe frost again on Thursday night. Email “National weather warning kicks in, with snow, ice and sleet expected ”. Feedback on “National weather warning kicks in, with snow, ice and sleet expected ”.